I recently asked Corey Harrell about any unfulfilled programming ideas he might have and he told me about his idea for a RegRipper Plugins maintenance Perl script. He was after a script that would go into the plugins directory and then tell the user what plugins were missing from the various "Plugins" text files. Note: I am using "Plugins" to refer to the "ntuser", "software", "sam", "system", "security" and "all" text files. These contain a list of Perl (*.pl) plugins that a user can use to batch run against a particular hive. He also mentioned that it might be handy to be able to exclude certain files (eg malware plugins) from being considered so if a user has deleted certain entries, they aren't constantly being reminded "Hey! There's a difference between what's in the "Plugins" file and what's actually available (ie the *.pl plugins)". UPDATE: This script was not intended to be used to blindly load every possible *.pl plugin into their relevant "Plugins" text file. It was intended for use as a diagnostic tool "What (*.pl) plugins are missing from my current "Plugins" file?" (eg "ntuser"). Users can then look at the missing plugins list and determine if they should/should not include them in their "Plugins" text file. UPDATE: Script ("PrintMissingPlugins" function) has been updated so commented-out entries (eg #ccleaner) in "Plugins" text files are not used in comparisons for missing *.pl plugins. Thanks Francesco! UPDATE: Script ("PrintMissingPlugins" function) has been updated so blank lines in "Plugins" text files are not used in comparisons for missing *.pl plugins Have also updated the Code and Testing sections. # This shouldn't affect us as we only call the plugin's getHive method. # as it could affect the *.pl plugin processing. # Modified (2012-04-04) re-instated "No missing plugins message"
# This code for determining a package's hive was cut / pasted / edited from "rip.pl" lines 42-67.
require $p; # "require" needs to be inside an eval in order to import package functions ? # and only a handful of plugins who actually return "All" as their hive. # In a fit of hacktacular-ness, we'll now also add the contents from the other "actual" arrays to @all_actual. # the lines in the "all" Plugin (@$listed_plugins), there will be a lot of differences reported. my $res = scalar(grep(/^($pkg)$/, @$listed_plugins)); # is this .pl listed in Plugins file ? my $ignore = scalar(grep(/^($pkg)$/, @excludelist)); # is this .pl being ignored ? my $res = scalar (grep(/^($plug)$/, @$actual_plugins)); # does this Plugin entry have a corresponding .pl file ? my $ignore = scalar(grep(/^($plug)$/, @excludelist)); # is this Plugin entry being ignored ? - Parses command line arguments using "GetOptions"
- Calls "PrintMissingPlugins" subroutine to compare the differences between a "Plugins" text file list with an "actual" *.pl plugins list. Function also allows for commented out lines (eg "# COMMENT") and blank lines in "Plugin" files. If you have RegRipper installed, you should already have the necessary Perl packages installed (eg File::Spec::Functions). It's not the most concise/efficient code. If in doubt, I tried to make it more readable (at least for me!). I also made more comments in the code so I wouldn't have to write a lot in this section. I think that might prove more convenient than scrolling up/down between the summary and the code. Finally, I should mention that I kept my "regripper-maint.pl" script (and my exclusion text file "regripper-maint-exclude") in "/home/sansforensics/". I didn't want the script to parse itself when looking for .pl plugin files. I suspect I could have just as easily called "regripper-maint.pl" from "/usr/local/src/regripper/". Meh. We'll start testing (on SIFT v2.12 using the default RegRipper install) with the 2 examples given in the script's Help message. Which seems OK as there's only one "sam" Plugins entry ("samparse"). So this example shows the script referring to our "regripper-maint-exclude" exclusion file (which has one line containing "ccleaner"). Hence, it ignores any "ccleaner" plugin comparisons. We can also see that while only 3 "ALL" *.pl plugins were found, there are 204 lines declared in the "all" Plugins file. The "all" Plugins file is a special case in that it can contain plugins which refer to more than one type of hive. See the code comments for more info on how I dealt with this (it ain't particularly pretty). Anyhoo, we can also see that there are 2 .pl plugins which are NOT declared in the "all" Plugins file. Open the "all" file and verify it for yourself - there is no "winlivemail" or "winlivemsn" entry. There are also 2 entries in the "all" Plugins file which don't have corresponding .pl files (ie "port_dev.pl" and "wlm_cu.pl" do not exist). That's gonna make it a bit hard to call those plugins eh? You can see that the "ccleaner" plugin is now included in the missing plugins. I subsequently viewed the relevant Plugin files and confirmed the number of plugin lines declared matched what was printed above. I could also have used the "wc -l" trick mentioned previously as well. Meh. Using Corey Harrell's idea, we've coded a RegRipper maintenance script which can detect discrepancies between whats declared in Plugin text files and what .pl plugins actually exist. While this script doesn't help you if you don't use the Plugin text files, it has still been an interesting programming exercise. I can feel my Perl-fu growing stronger by the day ... muhahaha! 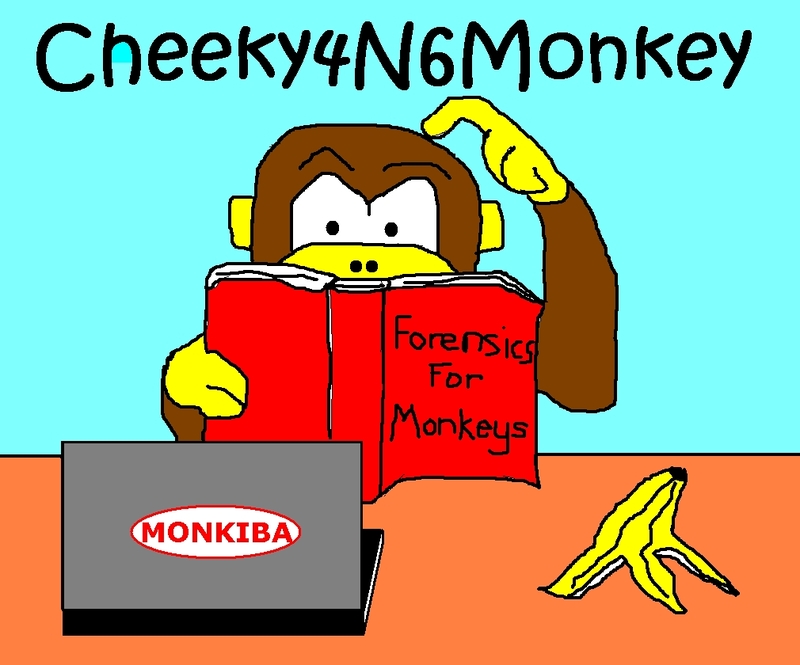 And for those that don't know, Cheeky4n6Monkey is now (intermittently) on Twitter (@Cheeky4n6Monkey) ... and co-incidentally(?) getting a lot less work done! Thankyou to all those who have already extended their welcome. As always, please leave a comment if you found this post helpful / interesting / snake oil. PS I will send a copy of this script to the RegRipper folks just in case they find it useful (Thanks Brett and Francesco!). This is a good idea, *IF* you want to simply fire a salvo at a hive file. Don't get me wrong...I applaud your ingenuity and effort. This really illustrates how the community can come together, when one person has a need and another one has a skill (and the time) to help fulfill that need. However, analysts need to keep in mind that RegRipper is more of a surgical tool than a "fire for effect" tool. My concern is that folks will be running plugins meant for one version of Windows (acmru.pl is meant for XP, not Win7...) and then making assumptions based on what they see. I provided the Plugin Browser, as well as the ability to list the available plugin details (via rip.pl), so that analysts would know what plugins they were adding to the various profiles. In fact, PB has a built-in capability for creating profiles. Again, thanks for your effort in this regard. Corey did mention to me that he selectively runs his plugins on an individual basis. So I was already thinking this script might not get much use. At least I got more experience in Perl (I think!). For the contents of the "Plugins" files, I just used whatever was the default on SIFT as a starting point. But I hear your point - analysts have to think before they act. One of the reasons why I wanted this capability was to make it easier to flag plugins that I might be interested in but was missing. I wanted a quick way to flag plugins not listed in plugin files so I could review them individually to see if I wanted to add them. Great post and awesome job on the script.